One Example Of The Many Pergola Styles We Build. 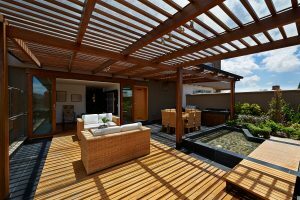 Some prospective home buyers have a pergola on their list of must-haves. Adding a pergola to your yard opens up the market for you and expands your range of potential buyers. This improves your chances of finding a buyer who will match or exceed your desired selling price. Pergolas are an outdoor entertainment classic. Combined with a timber deck, a pergola completes the perfect setting for a backyard BBQ. Pergolas add character to a backyard. Where decks provide a stage, pergolas construct a scene. A professional pergola builder can create pergolas in a vast range of styles to create a defined ambiance. Another benefit of a pergola is extending the home, providing a relaxing area by combining the comfort of inside and the freedom of the outdoors.